High- and low-water-content boilers compared — Darren McMahon. Boilers with a high water content are the ideal choice for many applications. Darren McMahon of Viessmann looks at boilers with both high and low water content. There is a argument currently being circulated that boilers with a high water content are a less practical and a more expensive choice than boilers with a low water content. One may expect companies that supply only low-water-content boilers to be somewhat biased towards that approach, but misinformation only confuses those for whom a high-water-content boiler is an ideal choice — such as district heating networks, schools, hospitals and any system with a large radiator coverage or underfloor heating. 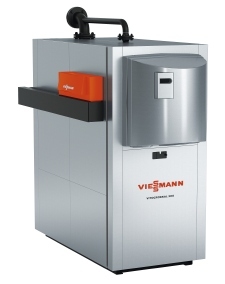 As a manufacturer of both types of commercial boilers, Viessmann is in the position of being able to give impartial, unprejudiced advice regarding which solution to use. Offering both options in additional to a range of renewable technologies, the company has no bias towards a particular product or technology. I’m sure most appreciate that different boilers are suitable for different applications. Low-water-content boilers are exactly that — holding only small amounts of water in their heat exchangers, typically 0.1 to 0.6 l/kW. They are almost always used in domestic installations and are usually now also the first choice for commercial applications in the UK. Being a simple and easy solution, it is easy to see why they are so popular, yet the easiest option is often not the best solution. Although low-water-content boilers are the preferred option for many specifiers, high-water-content boilers can deliver significantly higher efficiencies in many commercial applications. A low-water-content boiler requires a minimum flow rate, which is not always feasible or efficient. It also needs additional hydraulic parts to be specified, like circulation pumps, a by-pass or a low-loss header for larger-output boilers, for example. Whilst they are quick to provide primary heating circuit water, they don’t provide it instantly. In addition to this, the maintenance costs are much higher in a low-water-content boiler due to the multi-boiler installation and the additional ancillary components required for the system. High-water-content boilers (floor-standing boilers used in some commercial applications) hold larger volumes of water, typically between 0.6 to 1.4 l/kW. The modular boiler solutions that are common in the UK market can offer significantly higher efficiencies in many commercial applications, especially in conjunction with older heating systems. A second return connector for low return temperature, down to 30°C, results in an impressive utilisation of condensing technology. As such, the boiler operates at the lower condensing output temperature, allowing the water returning to the boiler to be significantly lower than the dewpoint of the flue gases (57°C). The system can then extract the latent heat in the water vapour of the combustion gases in the flue, producing condensate and increasing its efficiency markedly. In low-water-content boiler systems, such as multi-boiler cascade installations, high levels of water at a high temperature will be diverted via a low-loss header back to the boiler’s return, to maintain a constant flow within the boiler circuit, therefore less or even no condensing is achieved. In this situation, low-water-content boilers require a minimum flow rate achieved through fixed pump speed, often equal to the design flow rate, which is the flow required to achieve a difference between flow and return temperatures of 15 to 20 K at full output. This results in higher running costs due to the electrical demand. 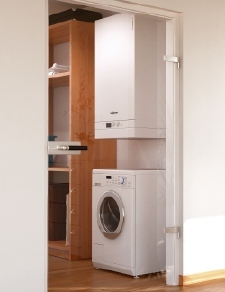 Low-water-content boilers such as the Vitodens 111-W are almost always used in domestic installations — and are usually now also the first choice for commercial applications in the UK. To support the claim that low-water-content boilers are the more efficient choice, some manufacturers make certain assumptions about how a high-water-content boiler is run. We’ve seen hypothetical supportive figures calculated, based upon situations where the boiler is turned off every night in winter. Having seven cold firings per week is simply not how a high-water-content boiler would be operated. Modern boilers are also well insulated with standby losses of less than 0.25%, meaning that even if the boiler is turned off in the evening it will retain its energy until the next morning. With an optimised system design for a high-water-content boiler, there would be no cold starts as a weather compensation control would prevent the system from cooling. That, in effect, is its purpose; the system is maintained at a temperature to ensure maximum efficiency and energy savings. In reality, during the night a high-water-content boiler would revert to a lower setback temperature, preventing the system from losing heat and therefore saving energy in the long term. Providing distorted and unrealistic examples of the efficiency of a high-water-content boiler is not helpful for those for whom the high-water-content option is the right choice. In reality, high-water-content boilers can bring significant operational cost savings over their lifetime for many retrofit installations, as well as the new construction projects for which they are the perfect choice, such as district-heating networks, as they have a large water volume with no minimum flow rate requirement and therefore no need for shunt pumps. Due to their thermal inertia they are the most suitable choice for a large and aged system volume; in many cases these systems require a flow temperature that is not recommended for low-water-content boilers. Darren McMahon is marketing director at Viessmann.